Facts about Eastern Chimpanzee. Eastern Chimpanzee is a sub variety of the common chimpanzee that belongs to the genus Pan of the Hominidae family. "Scientific name of the Eastern Chimpanzee is Pan Troglodytes-schweinfurthii, and they are native to Africa. The Eastern Chimpanzee are largely found in the Central African Republic, the Sudan, and the Democratic Republic of the Congo, Rwanda, Uganda, Tanzania and Burundi. The Eastern Chimpanzees will spend their time both on the ground and in the trees, but they will generally sleep in a tree where they will construct a nest intended for their night’s sleep. An adult male Eastern Chimpanzee in the wild is usually larger than the female chimpanzee, with the body height of 63 inches (160 cm), whereas the female Eastern Chimpanzee will appear with the body height of 51 inches (130 cm). 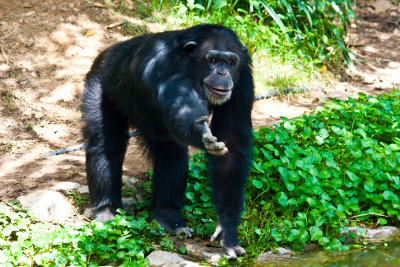 The adult Eastern Chimpanzee has a body weight that ranges from 88 pounds to 143 pounds (40 kg to 65 kg). The body of the Eastern Chimpanzee is covered with dark brown color hair, except for the fingers, face, toes, and soles of its feet and the palms of its hands. Both of its big toes and its thumbs are opposable, offering then a firm grip. The Eastern Chimpanzee will habitually use a tree branch as a tool to assist it to reach ants or termites in nests and will use sticks to hunt other tiny creatures. They also use to involve in organized hunting. In some situations, like killing the cubs of a leopard, this organized hunting chiefly seems to be a defensive effort, as the leopard is the major natural predator of these chimpanzees. However, the Eastern Chimpanzees occasionally band together and hunt other varieties of monkeys for meat. Remote cases of cannibalism have also been familiar in Eastern Chimpanzees. Eastern Chimpanzee varieties are found mostly in wet and arid forests, and woodland galleries extending into savanna forests. The Eastern Chimpanzee are omnivorous animals, and their diet is greatly variable consistent with seasons and individual populations. Fruits include about 50 % of their diet, but they also feed on other food materials. Creatures include a small part of their diet, but they are also an important part of the diet of several populations. Their habitat ranges are bigger in woodland forest medleys than in varied forest, with an average area, ranging from 2 to 155 square mile(5 square km to 400 square km). Similar to humans, the Eastern Chimpanzee is an omnivorous animal, which means that they mainly feed on animals and plants. They also feed on seeds, leaves, fruits, bark, small prey and pests, such as termites. The Eastern Chimpanzee is both terrestrial and arboreal, but it will spend most of its night time in the trees, whereas the majority of its time during the day is spent on the land. The Eastern Chimpanzee varieties use to live in communities that usually range from 20 to 150 or more chimpanzees, but they will spend the majority of their time in traveling in small groups of just a few chimpanzees. The Eastern Chimpanzee use to walk by making use of their knuckles and the soles of their feet, and they can walk erect for small distances. When come across a predator, the Eastern Chimpanzees will react with noisy screams and employ any object they can acquire against the threat. The leopard is the major natural predator of the Eastern Chimpanzees, but they will also happen to be a victim to lions. The maximum lifespan of the Eastern Chimpanzee is 40 years.